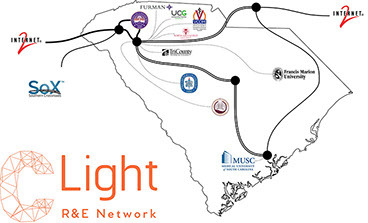 C-Light is a state-wide network of direct fiber connections. 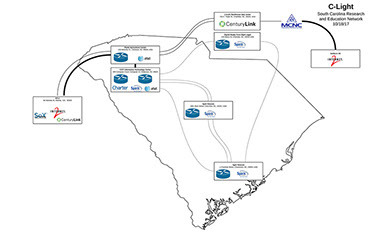 Managed by Clemson University this network reaches between Atlanta, Clemson, Greenville, Charlotte, Columbia, and Charleston. C-Light provides direct access to the National LambdaRail, Internet2 and other national and international research networks. C-Light specifically provides faculty across the state with the infrastructure they need to collaborate with colleagues and access resources nationally and internationally and ensures the capability to apply for major research grants from funding agencies like the National Science Foundation. In 2017, C-Light welcomed a new member in Furman University, who added a high-performance computing cluster of their own. Additionally, the C-Light backbone was upgraded to a 100 gigabit connection from its previous 10 gigabit connection. To learn more about C-Light or how to become involved, contact us. Click here for Guidelines for Telecommunications Rooms.